So maybe since each of us picked five tools we can’t live without, this is more like the Top 10 Kitchen Tools post. Regardless, here are our favorite workhorses and the reasons we love them. – Magnetic measuring spoons: I always got frustrated by the crazy ring that my measuring spoons were tethered to and thought, “There must be a better way!” But instead of recognizing a million-dollar idea when I saw it, I endured. Then one day I happened upon a set of magnetic spoons in a Taste of Home catalog. I’ve had them for several years now and use them constantly. The catalog has updated the set, and as of now, it looks like they’re even on sale! – Melon baller: For those times when you’re not feeling too steady with the knife, a melon baller is a great way to dismantle a watermelon, cantaloupe or honeydew. Plus, it makes the melon more presentable should you wish to serve it to guests – or just feel extra fancy eating perfectly rounded melon on the sofa in your pajamas. The melon baller pictured was passed down to me by my grandmother. Thanks, Big Mama Tillie! – Microplane grater/zester: This tool changed the way I look at parmesan cheese. I outgrew “shakey cheese,” and upgraded to blocks of parmesan. The Microplane is the easiest way to top off the pasta dish with freshly shaved parm. Plus, I’m not a big fan of box graters. If I need to shred a lot of cheese, I’ll do it with the food processor. But for smaller jobs, the Microplane comes in handy on at least a weekly basis. – Tongs: The tongs pictured are the smaller of the two I have, and they come in handy for so many jobs. Tossing pasta with other ingredients, picking up hot items (such as baby bottles being sterilized in boiling water), and yes, at just under five feet tall, I’ve been known to use them to reach small items in the cupboard without taking out the step stool. 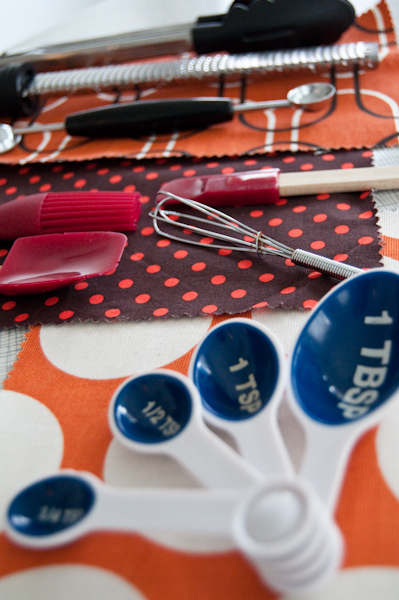 – Miniature spatulas: There are some places that a big spatula just can’t go. When you need to get in the little nooks and crannies – don’t miss a drop of that cookie dough or brownie batter! – these tools are incredibly handy. – Garlic press: It’s anyone’s guess as to why I waited so long to purchase one of these. It’s amazing how much this has simplified things for me, given that my knife skills for small items like garlic leave a lot to be desired. – Ceramic measuring cups: There’s something about having a solid feel in my hands to measure flour, sugar, cocoa powder or other dry ingredients. I much prefer these to the plastic variety. – Glass Nesting Bowls: From the smallest to the largest, this set is so versatile. The smaller sizes are ideal for spices, garlic and other small items to add in the cooking process, and the larger bowls can be for mixing or serving. – Pastry Blender: I’ve found alternative uses for this tool, such as mashing potatoes and squashing avocadoes for guacamole. – Kitchen Aid stand mixer: Ah, my beloved mixer. Okay, this is technically an appliance, but I think it counts. This is one of the single best kitchen gifts I’ve ever received, and I make use of it as often as possible. 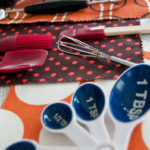 What are your favorite kitchen tools? Do you use any of our favorite tools in other creative ways? I know this looks gimmicky, but I love the Alligator Chopper and use it to dice onions, carrots, celery, or peppers for almost every meal I prepare. It’s very well made and easy to clean. 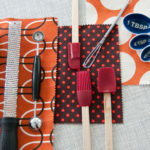 I also agree with the microplane zester and the pictured silicone brushes, which were revelatory. I use those constantly. Another favorite tool is a repurposed molasses jar, which I use to make and store dressings. And it doesn’t really count as a tool, but I also use these Fox Run jelly roll pans all the time. They still look great 5 years into owning them, and I use them for cookies, putting under leaky springform or tart pans, roasting vegetables, and even the occasional jelly roll. Worth every cent. Great hearing your ideas! I’ve been looking for a new jelly roll pan – thanks for the tip Rebecca.